Madeleine Stowe, Andie MacDowell, Drew Barrymore and Mary Stuart Masterson star in the wild west story of four fallen women on the run. Branded as outlaws, pursued by a posse tracked by Pinkerton detectives, the four must ride together to stay alive. But when they're double-crossed by a gang of ruthless desperados, the women decide it's time to stop running and start fighting. 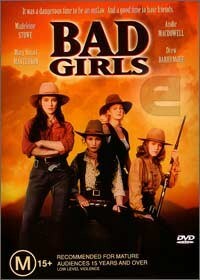 Bad Girls is a Hollywood attempt at a Wild Wild West western that solely stars an all-star female cast. Unfortunately this movie fails to hit the mark that features a clichéd storyline with Andi MacDowell stealing the show with her stellar acting. Probably worth a rent before a buy!